Also known as Chef Snacks. When you’re stirring stew, popping corn, or frying fritters there’s nothing as nice as sneaking a few bites when nobody’s looking. You can do The Wooden Spoon Slurp to see if the soup has enough salt or the macaroni has enough cheese. Or you can try the 7 Layer Taster where every combination of your 7-layer dip is tested — from cream cheese with salsa to guacamole with olives. Or you can do the classic Batter Binge, where that sweet and creamy dream liquid tastes like a chocolate-chip speckled swirl of heaven on your tongue. And hey, come on — eating the thing you’re cooking while cooking it really is good for everyone. See, nobody likes a Saltless Surprise, so it’s good for the cook to perform these vital Tongue Tests early and often to ensure a tasty, tasty, tasty, tasty, tasty, tasty meal. One tasty for every taste test. Read the first 20 pages of The Book of (Even More) Awesome to see if it’s any good! For me, its pasta tasting, where I grab a string of spaghetti while its cooking and taste it to make sure its good or not. (I use a fork though). Okay, whats supposed to happen then? Does it stick to the wall? If it sticks then its done, if it slides off it needs to cook a bit longer. And it’s also a fun excuse to throw food at the wall. OHHH, I was thinking ding dongs after #950. How dare I forget or neglect…I would never live it down! My favorite thing in the whole wide world, and known as best in our family for, “The Doctor of the POPCORN!!! Very important to get perfect ratios of butter and salt…sprinkle with engevita…hmmmMust have popcorn!!! My siblings and I would always fight over who got to “lick the beater,” but the one unbeatable trump card was the chef card. If you helped Mom make it, you had first dibs on the beater. I would always beg to help make the brownies . . . 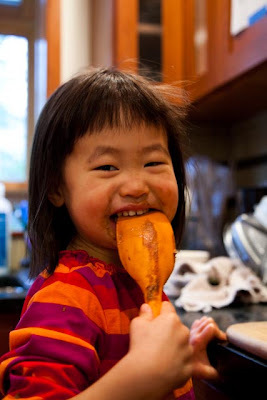 I always helped mom make the goodies, but my brothers always got to lick the beaters……….I got to lick the bowl. Same here with my brother and I! Good thing I don’t have kids, because I would be selfish and lick them myself. The best is eating while baking… forget eating while cooking. I just finished reading the first 20 pages of even more awesome & you wanted to know if it is good? the intro made me cry. It was just so well written. Neil – you’re the worst blogger ever!! …wait, how does this work again?? How hard were they to make, did they taste good? When my mom makes lasagna, my sister and I always test it before she layers it by scooping up some meat sauce in a lasagna noodle and sprinkling some cheese on top. it is AWESOME! Wait.. you taste bacon WHILE you’re cooking it? Like, when it’s still floppy and only sorta half cooked? Last time I was out camping with a bunch of people, I had to make the food for everyone. So here I was trying to cook for 20 people over a campfire and this one guy whispers in my ear to leave some bacon halfway done for him. When it was bacon time, I sizzled it for a while, held up a piece for him to examine. It was still very soft, floppy, and just gross looking…. he gave me a thumbs up. Hmmm…I find the thought of “floppy bacon” all kinds of disturbing. I’m a huge fan of cooking, and constanly trying new recipes……a couple of times i’ve ended up eating ahlf the dish before I serve it up……..need to watch my waist line now though!! And the “tasting to make sure it doesn’t have poison” excuse is a really good one.. I remember my dad used to use that on me a lot while I was growing up, whenever he wanted a bite (or several) of whatever yummy treat I was eating.. HA!! My mom use to do that exact same thing to me!! I guess that’s where I got it from. Hehehe :) my dad did that, too. And by “did that” I mean … “still occasionally does that”. I guess I went ahead and remarked about them anyway. Oh well. I have a friend who, on multiple occasions, has mixed up some brownie batter with no intention of actually baking brownies. She’ll leave the eggs out and just eat it from a bowl. My wife (little-miss-safety-first) and I often have a philosophical disagreement about whether or not we should be tasting the batter after we’ve put the eggs in. She insisted that I would almost certainly contract Salmonella, die, and leave her alone (and I assume miserable, without my wonderful presence).. However, we did a little research online and found a study that estimates that only about 1 in 20,000 eggs contains salmonella.. that’s 0.005% of eggs. We agreed that was an acceptable risk to take to still get to eat the yummy batter throughout the entire baking process.. She still doesn’t taste it mind you, but she’s more comfortable about the whole “Freddo’s probably not going to die” scenario.. I think the whole “raw eggs” danger is a tempest in a teapot. But it must have had a good PR campaign because a lot of people are freaked out about it! For example, Mike was really perturbed the first time we bought eggs in Europe where they are not refrigerated in the stores. Is that why we shouldn’t rub mystery teapots? They contain tempests? I don’t generally like to eat baked goods, especially cookies, but I LOVE the way my house smells when I bake, so I often make cookies or a key lime pie to make my house smell good, then give the treats to someone else to consume. Everybody wins! LOL, that’s correct. You don’t want to release that tempest on yourself! Not recommended. OK, so this really counts as eating after cooking, but it’s still great: eating the pudding that stuck to the kettle during cooking. I don’t really remember begging for the beaters as often as waiting for that kettle after mom poured the pudding into dishes. MMMMM, warm pudding! I agree with the brownie bowl licking, too! I still do this regularly. Hey, great idea to make batter without eggs just to eat the batter! AWESOME! Hey Neil – where do we submit our votes/requests for other cities for you to visit on your whistle-stop book tour? Bahaha … whistle-stop book tour. I like it. After he visits San Diego, he can pick you up and you both can cruise right through the greater midwest and come to STL … and you can bring my windshield wipers, k? Neil – get this tour scheduled! It sounds awesome! how about put a stop off to sydney australia on that book tour of yours? now wouldn’t that just be great! just don’t ask us if we really ride kangaroos to school & work. because believe it or not. Ha ha, and we Canadians don’t live in igloos, either! Anybody ever had a snow cone machine? I was maybe 5 and I decided I could make peanut butter, with marshmallows and a bag of peanuts, and how might you think that was…actually tasted pretty great, but I guess I broke the machine. On page 7, for a second I pondered as to where would I find a microwave? Time is in “Jetson” far too fast and furious. Anybody have that kind of visionary know-how, a personal friend in the Dragon’s Den…lots of Ka-ching floating around? Had one back in the 60s! Got about a thimble full out of it before my hands hurt from the crank, so then off to the corner store to get a big ole’ sloppy grape one. well then, perhaps ONE of the treat booths in Awesome Land theme park shall have to be Snow cones for sure…Pina Colada anyone? Oatmeal cookie dough is unequivocably the BEST. I even put 1/3 cup of oatmeal into my chocolate chip cookies. Mmmm…oatmeal. I second that. Mmmm … oatmeal. Oatmeal cookies, oatmeal creme pies, and straight up oatmeal. Yum. I just have to say though, SANS raisins. Don’t hate me. I think we should be thinking outside the box a little here.. do we really need to add small, discrete items like raisins or chocolate chips? Have we considered just adding a few spoonfulls of Nutella to the batter instead? Can someone get on this and report back how it goes? I’m willing to sample whatever comes out of this little experiment if you’re interested in sending some “nutella cookies” my way..
LOVE the picture you used for the post – that girl’s head in the bowl, mmmmm – what’s in there anyway? Just a thought – wouldn’t it be great to have a camera at the bottom of that bowl? All this talk of licking beaters and bowls and cookie batter slurping soup spoons and tasting pasta has gotten me REAL hungry. Eating while cooking, or just plain eating. It’s all Awesome. I just saw your book in Barnes and Noble and ran right home to check out your blog. I opened to the page about licking the beaters and laughed- I just did this!!!! Love it and love that you find something awesome in every single day! This is why I never sit down to a real meal on days I cook. I constantly snack on the ingredients while making the dish and end up too full by the time it’s done. this blog is really amazing! I love it!! when the book will be released in Brazil? the blog is really awesome!!!!!! For me it’s brownie batter. Mmm.